The Greater Swiss Mountain Dog is a very ancient breed, tracing its time of origin to approximately 2,000 years ago as a direct result of the Roman invasion and conquest of Europe. As a result of the crossing of the Roman Mastiffs with the local Swiss working dogs came the four Sennenhund breeds: Greater Swiss Mountain Dog, Appenzeller, Entlebucher and the Bernese Mountain Dog. It is generally accepted that the GSMD was the first of these breeds, and the other three developed from it. The "Swissy" is also thought to have been a major influence on the Rottweiler. The Greater Swiss Mountain Dog was recognized by the United Kennel Club in 1992. Primarily a draft breed, the Greater Swiss Mountain Dog is a large, powerful, alert, striking, short-coated, tri-colored dog of sturdy appearance. Self confident, watchful and fearless. Agreeable and devoted to his family, good with strangers. Strong in proportion to the body, but not heavy. Males have more distinct head development than females. The skull is flat and broad; strong, not clumsy. The stop is slight. The skull and muzzle are of equal length, and the skull is twice the width of the muzzle. The strong, straight muzzle is blunt, not pointed and never snipey. The lips are black and clean, as in a dry-mouthed breed. The flews are only slightly developed. Disqualifications: Undershot or overshot bites. Almond shaped and medium in size, neither deep set nor protruding. They are hazel to chestnut brown in color and have an alert, friendly expression. Rims are dark and close fitting. Disqualifications: Entropion or ectropion. Blue eyes. The nose is always black. The medium-size, triangular-shaped ears are gently rounded at the tip. They are set on fairly high, the top of the ear being level with the top of the skull, and hang close to the head when in repose. They are raised at the base and carried forward when the dog is at attention. The strong, muscular, rather thick neck is of moderate length. There should be no dewlap. The shoulder blades are long and well laid back, forming a moderate angle with the upper arm. They are well muscled and fit closely to the body. Set rather well apart, straight, with heavy bone. Pasterns are nearly vertical. The proportion of body length to height is 10 to 9. The chest is deep and broad, and the ribs are well sprung. The back is fairly long, strong and straight. The loin is broad and well muscled and the croup is long, broad and slightly sloping. There is very little tuck up. The muscular thighs are strong and broad. The moderately bent stifles taper smoothly into the hocks. The hocks are well let down. The rear pasterns are straight when viewed from the rear. Dewclaws must be removed from the hind legs except in countries where it is forbidden. Tightly knit, with well arched toes and strong nails. 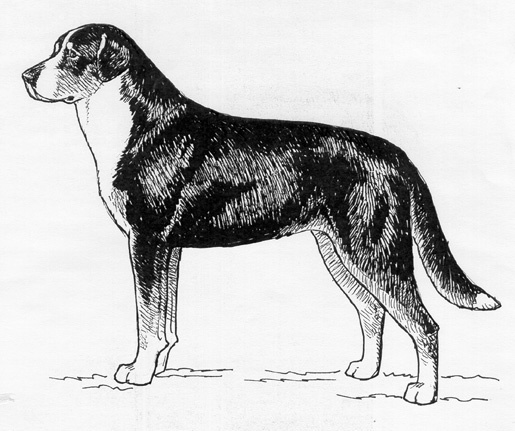 Set on the natural line of the croup, fairly heavy and reaching to the hock in length, the tail is pendulous when the dog is in repose. When the dog is alert or moving, the tail is carried higher and with a slight curve, but never curled or raised over the back. Double, consisting of a medium length outer coat and a dense, short undercoat. The undercoat should be as dark in color as possible. A shorter outer coat is permissible as long as there is undercoat present. Disqualifications: Distinctly long coat. Short coat without undercoat. The ground color is jet black. All markings are rich and symmetrical. Glossy rust-red markings are found on the cheeks, over each eye, on each side of the chest, under the tail, and on all four legs. There is a white blaze and muzzle. White markings include: a symmetrical white marking in the form of an inverted cross on the chest, white feet, and tail tip. A small white patch on the back of the neck or a collar are permitted. Rust is found between the white and the black on each leg. Disqualifications: Any ground color other than black. Albinism. Height is measured at the highest point of the shoulders. Height ranges are: males, 25½ to 28½ inches; females, 23½ to 27 inches. Balanced and free, with a good stride and strong drive from the rear. The legs move forward in a straight line.